Often purchasing the ingredients directly from local organic farmers, Artisana takes great care in making its organic raw nut butters. A completely Peanut Free facility, you won't have to worry about any peanut allergies with these great butters! How ever shall you choose?? I started with the Cacao, because I was interested in chocolate of course! It was a little dry just on bread. I think putting it on toast would have been Cacao bliss for sure. So much healthier than the processed spreads on the market, which contain added sugar and salt. This raw butter would be great on toast and what about a grilled nut butter sandwich! yum! High in protein and rich in antioxidants this is a healthy way to get your Omega 3 healthy fatty acids in. No need to refrigerate these butters which makes it even easier to take the serving size packets with you or put in your students lunches. 100% organic, 100% all natural. Nothing added to these great raw nuts, which are pureed at a control temperature. Raw nuts maintain much more of their vitamins and minerals that were intended for our health. They make these nut butters in small batches for uniformity and control. Detail oriented, just as all food companies should be. In addition to nut butters they also have superfoods like Acai, and coconut butter and oil. 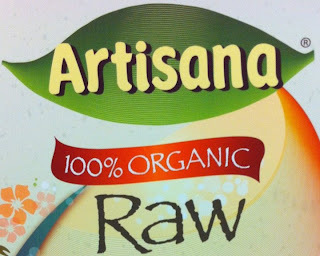 Artisana is a great name for this company as they are truly an artist when it comes to making 100% organic nut butters. Check out their website for great recipes and nutritional charts on each of the nut butters! I received products in exchange for an honest review. I'd love to try the Cocoa Bliss!! I'm sure everyone at my house would love it! :D Thanks for the review! I have never heard of this brand, but now I want to try it! Thanks! Love that they are made in a peanut-free facility. It is so hard to find ones that aren't.